Her mother asked, "How was the honeymoon?" "Oh, Mum," she replied, "the honeymoon was wonderful! So romantic..." Suddenly she burst out crying. 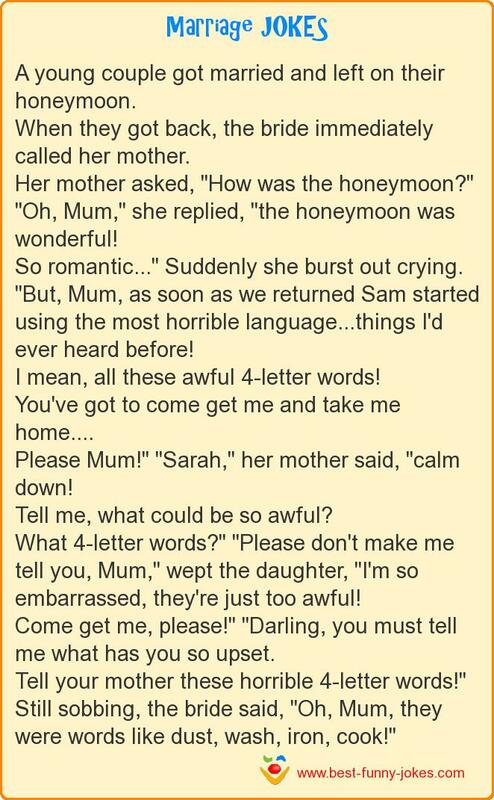 "But, Mum, as soon as we returned Sam started using the most horrible language...things I'd ever heard before! I mean, all these awful 4-letter words! Please Mum!" "Sarah," her mother said, "calm down! Tell me, what could be so awful? What 4-letter words?" "Please don't make me tell you, Mum," wept the daughter, "I'm so embarrassed, they're just too awful! Come get me, please!" "Darling, you must tell me what has you so upset. Tell your mother these horrible 4-letter words!" Still sobbing, the bride said, "Oh, Mum, they were words like dust, wash, iron, cook!"